molly moon's homemade blog: Wishin' and Hopin' and Plannin'! Wishin' and Hopin' and Plannin'! It's that magical time of year where ladies all over Seattle and beyond are scanning magazines and blogs in search for the dress to wear to the grandest celebration of their lives -- their wedding day! So many decisions have to be made. From flowers, to favors, to venue -- planning a wedding is no easy task. And, we think one couple in particular had one of the most charming weddings we've ever seen, er... read about. Ty and Lauren Debevoise creatively turned Jeni's Splendid Ice Cream Parlor (Ohio) into Jeni's Splendid Wedding Parlor. 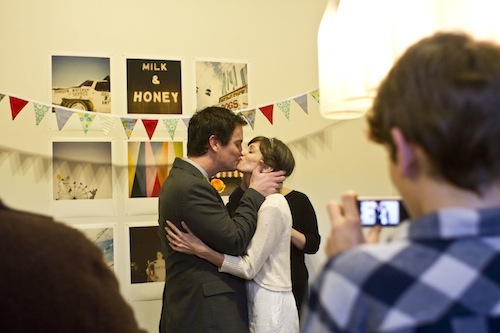 That's right, a wedding in an ice cream scoop shop! How cute is that? Talk about brilliant. Venue? Check. Dessert? Check. Happy guests? Check. Happy couple? Double check! And, we know of a few Seattle scoop shops that would be the perfect locations for a celebration of wedded bliss. *Wink* Imagine our frilly and feminine Queen Anne shop all dressed up for a wedding! Swoon. But, if our cute shops don't tickle your wedding fancy, there's always our beautiful, big, blue truck! 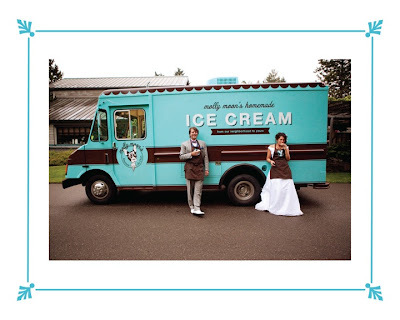 We loved having Molly Moons at our wedding!